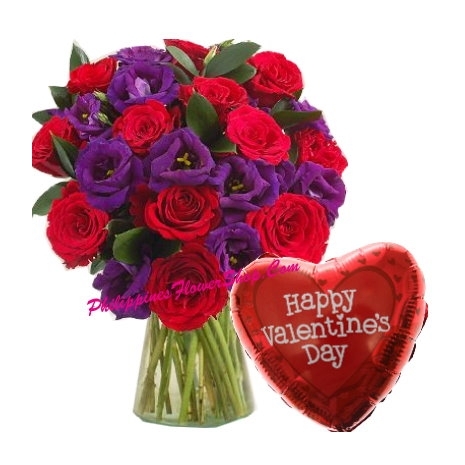 Flowers are a gift thats tried and true.12 red rose & purple seasonal flower with Valentines Day Balloon.No matter where you look today, you can find all kinds of gifts of the market; however, you will not be able to find one as special as a Valentine gift. You can send a Valentine balloon & rose vase that can convey any message you desire to just about anyone. Please note: Balloons could be in inflated or deflated state while delivered in provincial area. If delivered in deflated state, a free pumper would be provided along with the balloon, if delivered in inflated state, no pumper would be provided.